Jammed Button Making Machine? Let us help you with that! Does your Tecre button maker machine look like this one pictured below? Don’t panic! 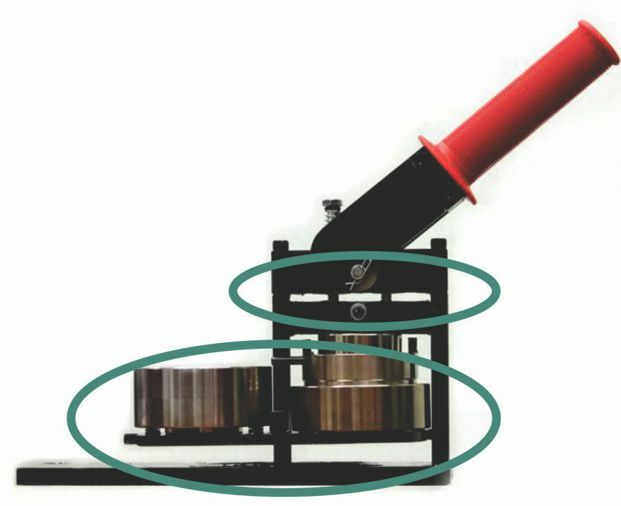 This is a typical machine jam, and is most often caused by either loading too many parts or using too thick of paper material in the button machine. When this happens the button maker locks up, and you would be unable to separate the upper and lower die. To help you alleviate this issue, follow the steps outlined below as “DO”. 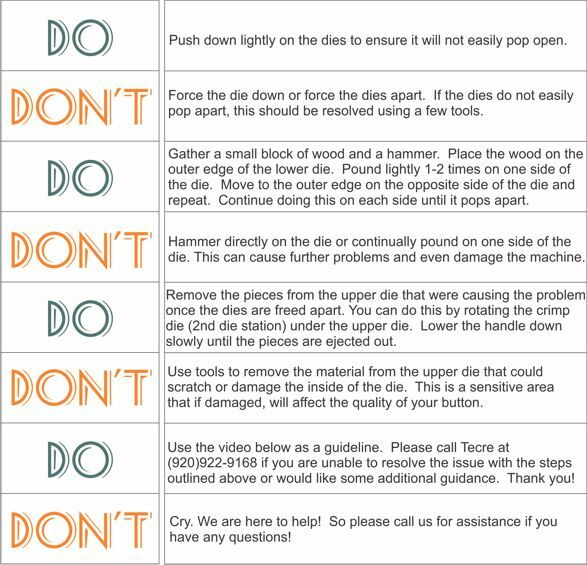 We also have gathered some ideas of things you should not try when resolving a button machine jam. This entry was posted in Manual Button Maker Machine and tagged Button Machine, Button maker, button maker machine, button making, jam, Jammed Machine, machine help, Machine locked up, Manual Machines, troubleshoot. Bookmark the permalink. 17 Responses to Jammed Button Making Machine? Let us help you with that! Yay, it worked. Thanks Brian. Thanks, Brian! We’re back in business! Appreciate your help!! Perfect! Worked just like you said it would. Thanks so much Brian! Great video. It unjammed my machine. Thanks. Thank you so much for this video! After two knocks on each side exactly like shown in the video, I was back in business! It was so easy! We LOVE to hear this, Lisa. Thank you!!!! LIFE SAVING VIDEO! Thank you so much! Thank you. This video was helpful. I love making buttons. Glad it helped! Happy button making! We seem to have jammed our paper punch for the button machine. Any tips? Need assistance fast! Hi Heather! Please call (920)922-9168. We will be happy to assist you over the telephone! Pingback: The 10 Commandments of Button Making - Tecre Co., Inc.Tecre Co., Inc. Thank you so much for the help I was getting very frustrated with the machine and myself. But you solved it all and thank you again. Great help! Thanks so much!